Yesterday and today I have attended the UK developer Vista and Office launch at Reading. Really enjoyed the event, there was a great buzz around with everyone seeming to enjoy what Microsoft was offering. I missed the keynote and Mark’s, but they are downloadable on the Microsoft site so I will be watching them tomorrow, along with the Office track videos. Daniel Moth gave a great presentation on whats new in Vista for the developer, not touching the .net framework features, but instead the core APIs included. Covered a lot in a short space of time, but it was great to see how easy it was to use the APIs (via PInvoke) even without having the managed wrappers. Martin Parry gave us an insight into the security and reliability aspects of Vista which was good to see. Mike Ormond went over WF (Workflow), gave some really useful tips on creating your own activities and it was good to see not just drag and drop stuff. He also went over the RSS platform in Vista as part of what he was building (WF RSS Reader), not heard much about this but sounds really interesting, might blog more about it soon. Mike Taulty ended the day talking about WCF, Mike is such a great presenter (like all the DPE team) and really gave a great insight into WCF showing a lot of the new uses having a simple demo but yet demonstrating the power of WCF. Really good, wish I had a use for it. The day was excellent and has started to get me more excited about Vista. After the day, I went to the Geek Dinner, this was my first one so I wasn’t sure what to except. Great to have a chat with people about technology and the world over Pizza and Wine. If you haven’t attended one before, definitively would recommend it, its has a great atmosphere and everyone attending is really friendly. 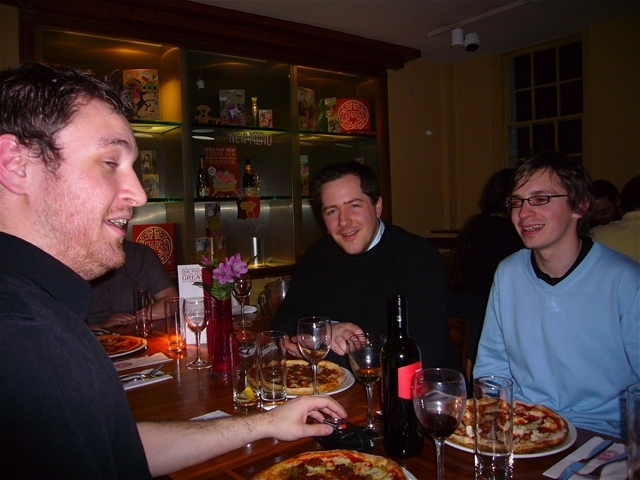 Simon Middlemiss, who I with on the table, has some of the pictures he took on his blog (one including me, I’m the one in the blue….) . After the dinner, some of us continued at the hotel bar for more chat and drinks, this continued into the small hours (got to my room at about 2am) with the NxtGenUG boys (Richy, Dave, John), Zi and me having a really great time (or at least I did ;)), it was a great end to a great evening. Zi took some pictures of the whole evening, which could be interesting…., once I have the link I’ll post it. On Saturday, I attended the coding session creating a Vista chat application using WCF and WPF. Was an interesting setup (90 computers in the cafe in Building 2), afterwards there was a quiz with everyone in teams while having lunch. That was fun but sadly I didn’t win anything. Two great days, meet loads of cool people and had great fun. Bring on WebDD!! Next Next post: Sapphire: New Web Form designer in Visual Studio Orcas.